Konrad Zacharias Lorenz (November 7, 1903 – February 27, 1989) was an Austrian zoologist, animal psychologist, and ornithologist. He is considered one of the founders of modern ethology. Lorenz studied instinctive behavior in animals, especially in greylag geese and jackdaws. Working with geese, he re-discovered the principle of imprinting (originally described by Douglas Spalding in the nineteenth century) in the behavior of nidifugous birds. Lorenz was a close associate of Niko Tinbergen, and together with Karl von Frisch the three were awarded the Nobel Prize in Physiology or Medicine in 1973. Lorenz's most enduring contributions include his work on instincts, particularly imprinting; his influence on a younger generation of ethologists; his methods of carrying out research with animals without cruelty; and his popular works, which were enormously important in bringing ethology to the attention of the general public. Lorenz saw humankind as different from animals, in that we have overcome our instincts and are free from the constraints of the environment, free to act for both good or ill. He recognized that such freedom requires responsibility to tame it, if we are not to destroy ourselves and our world. Thus, his final contribution may be the warning that the most significant problems humanity faces today are moral and ethical ones. Konrad Zacharias Lorenz was born in Altenberg, near Vienna, Austria, on November 7, 1903 to Adolf Lorenz and Emma Lecher Lorenz, both medical doctors. Always fascinated with animals, he kept a menagerie at home. However, his father insisted that he become a physician, and so Konrad Lorenz began a premedical curriculum in 1922 at Columbia University. He returned to Vienna in 1923 to continue his studies at the University of Vienna until 1928. Konrad Lorenz received his medical degree in 1928. A year before, he married Margarethe Gebhart, also a doctor. Then, studying at Ferdinand Hochstetter's Anatomical Institute at the University, he received his doctorate in zoology, in 1933. During his early period, he set up many of his hypotheses on animal behavior, such as imprinting, "innate releasing mechanism," and "fixed action patterns." After serving as an assistant in the Anatomical Institute, Lorenz was a Privatdozent (unpaid instructor) at the University of Vienna from 1937 to 1940. During the 1930s, Lorenz established the major theoretical foundations of classical ethology. His basic insight, shared with predecessors and teachers, was that some instinctive behavior patterns were fixed in form and just as characteristic of species as organs. Lorenz planned to analyze instinctive behavior using comparative techniques. 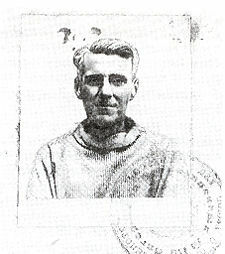 It was during this period that he met and began a close personal and working relationship with Niko Tinbergen. Lorenz joined the Nazi Party in 1938 and accepted a university chair under the Nazi regime. In his application for membership to the Nazi-party in 1938 he wrote: "I'm able to say that my whole scientific work is devoted to the ideas of the National Socialists." His publications during that time led in later years to allegations that his scientific work had been contaminated by Nazi sympathies: his published writing during the Nazi period included support for Nazi ideas of "racial hygiene" couched in pseudoscientific metaphors. In 1940, Lorenz became a professor of psychology at the Immanuel Kant University in Königsberg (later the Russian port of Kaliningrad). He was drafted into the Wehrmacht in 1941. He sought to be a motorcycle mechanic, but instead he was assigned as a medic. Sent to the front near Witebsk in 1942 he was taken as a prisoner of war in the Soviet Union, where he worked with doctors in various camps from 1944 to 1948. During this time he observed the parallels between the psychological effects of Nazi and Marxist education. The Max Planck Society established the Lorenz Institute for Behavioral Physiology in Buldern, Germany, in 1950. In 1958, Lorenz transferred to the Max Planck Institute for Behavioral Physiology in Seewiesen. In 1969, he became the first recipient of the Prix mondial Cino Del Duca. Lorenz retired from the Max Planck Institute in 1973 but continued to research and publish from Altenberg (his family home, near Vienna) and Grünau im Almtal in Austria. He shared the 1973 Nobel Prize in Physiology or Medicine "for discoveries in individual and social behavior patterns" with two other important early ethologists, Nikolaas Tinbergen and Karl von Frisch. When accepting the Nobel Prize, he apologized for a 1940 publication that included Nazi views of science, saying that "many highly decent scientists hoped, like I did, for a short time for good from National Socialism, and many quickly turned away from it with the same horror as I." It seems highly likely that Lorenz's ideas about an inherited basis for behavior patterns were congenial to the Nazi authorities, but there is no evidence to suggest that his experimental work was either inspired or distorted by Nazi ideas. Konrad Lorenz died on February 27, 1989, in Altenberg. In several seminal papers, Lorenz set forth the theoretical concerns, findings, investigatory methods, and remaining problems of Ethology. Lorenz's methods were always conventional. He never did a formal experiment, and his descriptive observations were often anecdotal. He infuriated his more conventional colleagues by saying, "If I have one good example, I don't give a fig for statistics." By this he meant that if he had seen an animal do something striking, he did not need to see a lot of other animals do the same thing to confirm what he already knew. 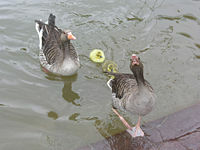 The egg-rolling behavior of the greylag goose is a widely cited example of a fixed-action pattern, one of the key concepts used by ethologists to explain animal behavior. The comparative study of human and animal behavior and learning was a dominant theme throughout Lorenz's work. He loved animals and kept an enormous variety, including jackdaws, geese, dogs, and fish. He argued that perceptual and cognitive apparatus could be treated like other organs that had evolved in relation to the environment. Even the "disposition to learn" items crucial to survival could be so explained. Evolutionary psychology and sociobiology are among the contemporary developments that build on these foundations. Imprinting, a rapid, quite stable form of learning in which a social animal's early experiences affect its later social or sexual behavior, apparently without the need for reinforcement. Family of greylag geese. The goslings imprint on the first suitable moving object, in this case their parents, and follow them constantly imitating their behavior. His doctrine of imprinting is still a focus of research interest. Filial imprinting, when a young animal recognizes the characteristics of its parent, was first noted by biologist Douglas Spalding in the nineteenth century and rediscovered by the early ethologist Oskar Heinroth, Lorenz' teacher. This phenomenon is most obvious in nidifugous birds (who leave the nest shortly after hatching) and reptiles. Lorenz demonstrated how incubator-hatched geese would imprint on the first suitable, moving stimulus they saw within what he called a "critical period" of about 36 hours shortly after hatching. Being present with the goslings during their hatching, Lorenz found that the goslings would imprint on himself. As a result of this he is often depicted being followed by a gaggle of geese who had imprinted on him. Lorenz always believed that humanity was in danger from the allegedly deleterious effects of civilization. He hypothesized varied causes for these effects, successfully postulating racial degeneration, uninhibited aggression, and environmental degradation during his career. In his book On Aggression (1966), Lorenz claimed that intraspecies aggression, normally an adaptive phenomenon in animals, has turned deadly in humans because our development of new weapons that can kill at a distance (which has outrun our innate inhibitions against killing). According to Lorenz, aggression involves stored instinctive energy and needs to be discharged. Then follows a refractory phase to build up the energy that has been flushed much like the flushing and refilling of a toilet. This approach incited an international debate on the biological bases of human behavior. Konrad Lorenz also contributed to philosophy. In his book Behind the Mirror, Lorenz considers the old philosophical question of whether our senses correctly inform us about the world as it is, or provide us only with an illusion. His answer comes from evolutionary biology. Only traits that help us survive and reproduce are transmitted. If our senses gave us wrong information about our environment, we would soon be extinct. Therefore we can be sure that our senses give us correct information, for otherwise we would not be here to be deceived. All the advantages that man has gained from his ever-deepening understanding of the natural world that surrounds him, his technological, chemical and medical progress, all of which should seem to alleviate human suffering... tends instead to favor humanity's destruction" (Lorenz 1974, 26). "all species... are adapted to their environment... including not only inorganic components... but all the other living beings that inhabit the locality (Lorenz 1974, 31). To gain a desired prey, a dog or wolf will do things that, in other contexts, they would shy away from: run through thorn bushes, jump into cold water and expose themselves to risks which would normally frighten them. All these inhibitory mechanisms... act as a counterweight to the effects of learning mechanisms... The organism cannot allow itself to pay a price which is not worth the candle (Lorenz 1974, 53). A closer examination shows that these beings... not only do not damage each other, but often constitute a community of interests. It is obvious that the predator is strongly interested in the survival of that species, animal or vegetable, which constitutes its prey. ... It is not uncommon that the prey species derives specific benefits from its interaction with the predator species (Lorenz 1974, 33). Lorenz asserted that humanity is the one species not bound by these mechanisms, being the one species which has defined its own environment: "[The pace of human ecology] is determined by the progress of man's technology" (Lorenz 1974, 35). Not only, but human ecology (economics) is governed by mechanisms of positive feedback, defined as a mechanism which tends to encourage behavior rather than to attenuate it (Lorenz 1974, 43). Positive feedback always involves the danger of an "avalanche" effect... One particular kind of positive feedback occurs when individuals of the same species enter into competition among themselves... For many animal species, environmental factors keep... intraspecies selection from [leading to] disaster... But there is no force which exercises this type of healthy regulatory effect on humanity's cultural development; unfortunately for itself, humanity has learned to overcome all those environmental forces which are external to itself (Lorenz 1974, 44). The competition between human beings destroys with cold and diabolic brutality... Under the pressure of this competitive fury we have not only forgotten what is useful to humanity as a whole, but even that which is good and advantageous to the individual. ... One asks, which is more damaging to modern humanity: the thirst for money or consuming haste... in either case, fear plays a very important role: the fear of being overtaken by one's competitors, the fear of becoming poor, the fear of making wrong decisions or the fear of not being up to snuff (Lorenz 1974, 45-47). Together with Nikolaas Tinbergen, Lorenz developed the idea of an innate releasing mechanism to explain instinctive behaviors (fixed action patterns). Influenced by the ideas of William McDougall, Lorenz developed this into a "psychohydraulic" model of the motivation of behavior. These ideas were influential as ethology became more popular in the 1960s, but they are now regarded as outdated. Lorenz's writings about evolution are also now regarded as outdated, because he tended towards group selectionist ideas which have been heavily reinterpreted since the rise of sociobiology in the 1970s. Lorenz's most enduring contributions thus seem to be his empirical work, especially on imprinting; his influence on a younger generation of ethologists; and his popular works, which were enormously important in bringing ethology to the attention of the general public. Though he demonstrated that the instinctive behavior of animals could be analyzed through a repertoire of standard techniques, many of the details of his analyses of behavior appeared to be incomplete. Some would say that Lorenz' most significant contribution and legacy does not lie in any of his theories but in the good example he set with his methodology. He never deprived the animals of basic physical or emotional needs. He never killed them, mutilated them, or tortured them. All these cruel methods were once considered indispensable for animal studies, but Lorenz proved it was possible to win a Nobel Prize without using them. Marc Bekoff (2006) has written about Konrad Lorenz, "I remember meeting Lorenz at an ethological conference in Parma, Italy, and his passion and enthusiasm were incredibly contagious. For hours, he told stories of the animals with whom he had shared his life and never once repeated himself. He clearly loved what he did and loved his animal friends." Some might say that Lorenz's most enduring legacy was his almost prophetic vision of the relationship between market economics and the threat of ecological catastrophe. Although he ill-advisedly professed agreement with Nazi ideas at one time, he was shocked to discover the way in which they were put into practice. His autobiographical account and thoughts at the time of receiving his Nobel Prize reflected his recognition that the problems humanity faces today are moral and ethical ones. While he saw humankind as different from animals, in that we have overcome our instincts and are free from the constraints of the environment, free to act for both good or ill. There are three Konrad Lorenz Institutes in Austria; one of them is housed in his family mansion at Altenberg. Lorenz's best-known books are King Solomon's Ring (1952) and On Aggression (1966), both written for a popular audience. His scientific work appeared mainly in journal articles, written in German; they became widely known to English-speaking scientists through the descriptions of it in Tinbergen's 1951 book The Study of Instinct, though many of his papers were later published in English translation in the two volumes titled Studies in Animal and Human Behavior. Lorenz, K. Z. 1957. Comparative study of behavior. in C.H. Schiller (ed. and trans.). Instinctive behavior: The development of a modern concept. London: Methuen. Lorenz, K. Z. 1975. Kant's doctrine of the a priori in the light of contemporary biology. In Richard I. Evans, Konrad Lorenz: The man and his ideas. New York: Harcourt Brace Jovanovich. Autobiography on the Nobel Foundation website. The Konrad Lorenz Institute for Evolution and Cognition Research – located at his family mansion in Altenburg. This page was last modified on 23 April 2018, at 15:41.